Does Nutritional Yeast sound good to you? Me either. But, I was introduced to it recently, and guess what? It’s actually really good—and better yet, it’s good for you. Sugar-free, dairy-free, & gluten-free, nutritional yeast is naturally low in fat and sodium. Since it has a cheesy, nutty flavor, it works as a cheese replacement in many recipes, making it a vegan’s best friend. Since it’s healthy and tasty, I’ve made friends with it too. So, what the heck is it? Well, for the full scientific explanation, check it out on Wikipedia….but in short, it’s a deactivated yeast sold as powder or flakes. It’s a source of protein and vitamins, and it’s often available fortified with vitamin B12. You can find nutritional yeast in health food stores….I bought it at Whole Foods. It’s not cheap, but neither is cheese, and a little goes a long way. I’ve used nutritional yeast in pesto, I’ve breaded chicken cutlets with it, and I’ve sprinkled it and on pasta and salads. 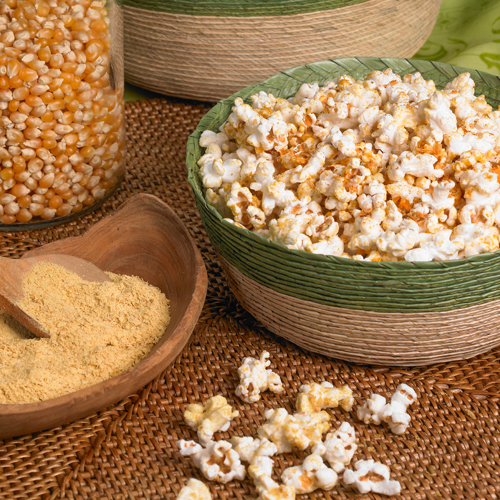 Nutritional yeast makes a really tasty topping for popcorn, too, plus you can really enjoy it knowing it’s good for you. 1. Place the popcorn in a large bowl. 2. Mix the nutritional yeast, italian seasoning mix and garlic powder together in a small bowl. 3. Drizzle the melted butter over the popcorn and toss it. 4. Sprinkle on the nutritional yeast mixture and toss again. 5. For a little extra zip, sprinkle on a little Cajun seasoning. Gimme a F-E-S-T! Football Fest. Beer Fest. Fan Fest. Media Fest. And last but not least, MAJOR Calorie Fest! Yep, it’s Super Bowl time. For me, the Super Bowl is all about two things: the Doritos commercials and, of course, the snacks. However, I am so over the predictable calorie-heavy buffalo wings and the cheese-laden nachos. Yet, a vegetable platter just doesn’t seem like football fare. Hmmm, there must be some middle ground! This afternoon, I remembered that ALC shot a yummy recipe recently for the Popcorn Board that fits the occasion perfectly. – Preheat oven to 300F. – In a large buttered bowl, combine popcorn, peanuts and raisins. – In small saucepan stir together honey, water and lemon juice; bring to a boil. Cook and stir over medium heat until mixture reaches 250 degrees Fahrenheit, or hard ball stage on a candy thermometer. 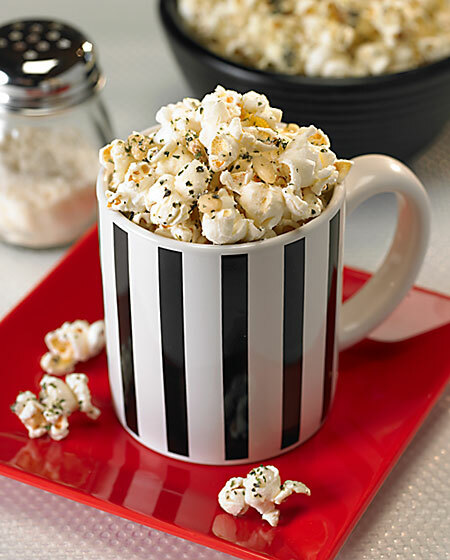 – Pour over popcorn; quickly toss to mix thoroughly. – Turn onto a buttered jelly roll or large baking pan. – Bake for 20 minutes, stirring occasionally. – Use freshly squeezed lemon juice for the best flavor. – The cold water test is a sure bet when testing for the hard ball stage of a candy mixture. Drop a small amount of the syrup into cold water. It will form a hard ball. If you take the ball out of the water, it won’t flatten. The ball will be hard, but you can still change its shape by squashing it. – Add dried fruits such as cranberries, cherries, pineapple, blueberries, apricots to mix it up a bit. Why shouldn’t adults enjoy the whimsical play of a dessert on a stick? 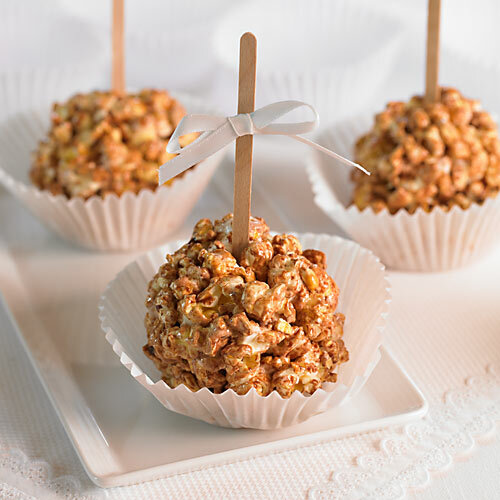 Here’s a popcorn ball that’s not just for kids! Traditional popcorn balls are usually loaded with gooey sweetness, but I’ve created a contemporary version with more grown-up appeal. These coffeehouse-inspired popcorn balls are made with caramel, chocolate and espresso powder—what a combination! Did you know that macchiato means marked or stained? In this case, the popcorn is “marked” with a little espresso. You have to try them—I’ve already eaten 3. Okay, maybe 4!!!! – Place popcorn in large bowl. In small bowl, stir together espresso powder and warm water. 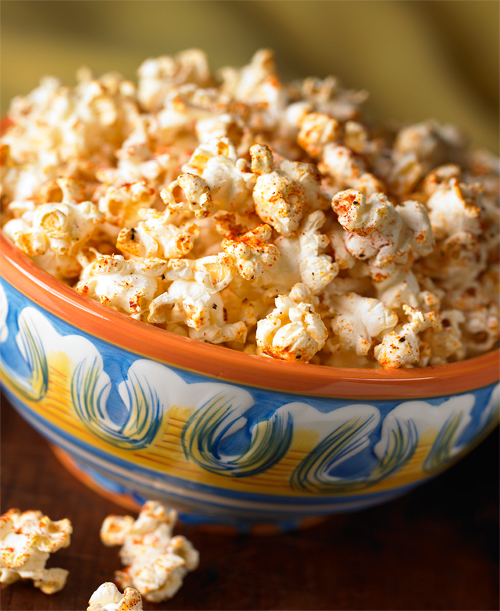 – Pour caramel mixture over popcorn and quickly stir until popcorn is well coated. Using greased hands, shape mixture into 6 balls. Insert a stick into each ball. – Store in airtight container up to 1 week. – You can use store-bought popcorn; air popped popcorn or your favorite microwave popcorn. – For a sweeter treat, use kettle corn. – Instead of forming the popcorn mixture into balls, spread it in single layer on a baking sheet. Let sit for 30 minutes and break into clusters. – For added coffeehouse flavor, stir 1/4 teaspoon ground cinnamon into the espresso mixture. Put Some Pop In Your 4th! A Fourth of July tradition dear to my heart is the annual party given by my friends John and Terry. We have been a part of it for the past 30 years, give or take a few missed ones. Things change from year to year, whether it be moving to different towns, kids growing up, or jobs changing, but two things that stay the same are the excellent company and the delicious food John & Terry serve. We all bring appetizers and desserts, and this year I’m going to steer away from the norm and bring a little “pop” to the party!!! Seems appropriate, yes? We photographed this recipe for the Popcorn Board back in December, and we thought it would be a perfect sweet treat for the Fourth since Heather propped it with an all-American theme. 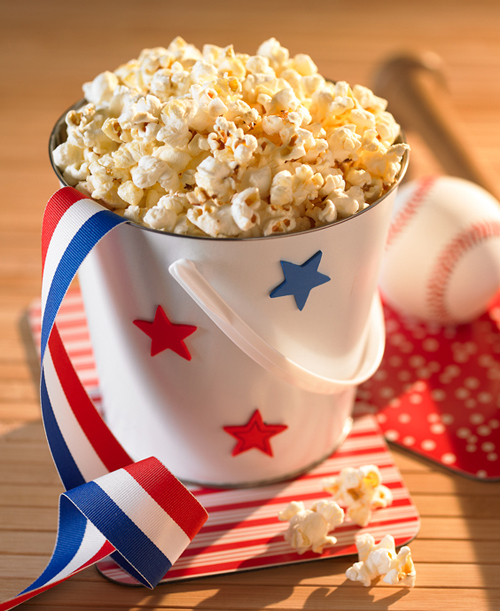 Parties, pools, baseball, fireworks, and popcorn—what could be better than that! Enjoy this recipe — I know John and Terry’s guests will!!! – Heat oil in medium-sized pan until hot. – Add popcorn and sprinkle all of the sugar over it. – Cover and shake continuously until popped. Back in April, we ran a post, Pop ‘Til You Drop, that featured a recipe for an addictive snack recipe, Popcorn con Pesto. That post generated so much interest that we thought we should introduce you to another studio favorite from our December shoot for the Popcorn Board. This spicy-hot recipe for Cajun Corn is just perfect for casual summer gatherings where a little southwestern flavor is just the ticket. Serve this with a few frosty Margaritas by the pool… yes, that’s happy snacking! Recipe courtesy of the Popcorn Board…. Pour butter over warm popcorn. Combine remaining seasonings and sprinkle over popcorn; toss to mix. For crispy popcorn, bake in 300° oven for 5 to 10 minutes, stirring once. Some of the most fun we’ve had in the studio of late was a recent shoot we did for The Popcorn Board. We photographed (and sampled!) a variety of pop-a-licious recipes for their website redesign. 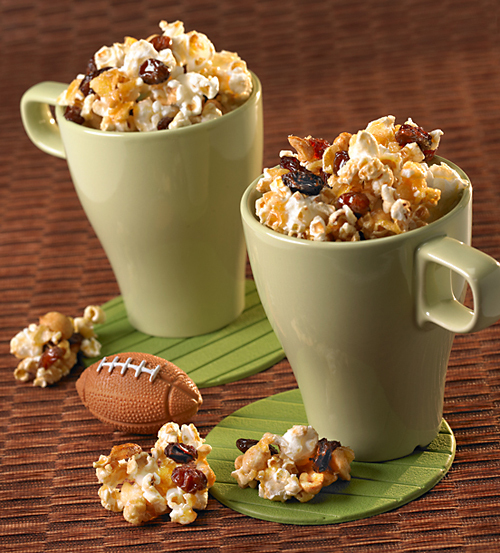 We shot popcorn snack mixes, popcorn balls, popcorn pie, popcorn bars, and more. It seemed like the popping never stopped! Our hands-down favorite recipe was the Popcorn Con Pesto. Warning: it’s highly addictive! – Put popped popcorn in a large bowl and keep warm. – In small saucepan, melt the butter; add pine nuts, Parmesan, basil, parsley and garlic powder. – Pour over popped popcorn, stirring well.